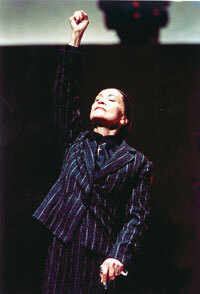 "Chita Rivera is a remarkable actress and her Bernarda is riveting. Whereas Nora McClellan�s performance is impressive and beautiful for its restraint and poetic control, Rivera�s is impressive for the thrilling risks she takes and for the physicality with which she underscores Bernarda�s emotional torment." CHITA RIVERA has no problem admitting that her long, celebrated career in musical theater has a downside. Most people have trouble imagining the Puerto Rican-American actress as anything other than a classic triple threat � a reputation she has earned in almost five decades of hard work on Broadway, from the chorus of the original stagings of "Call Me Madam" and "Guys and Dolls" through a career-making role in "West Side Story" to her Tony-winning performance in "Kiss of the Spider Woman." But serious, spoken-word theater? Rivera is not the first actress who comes to mind. That's why Rivera was floored when she got a call out of the blue from director Lisa Peterson, whom she had never met. 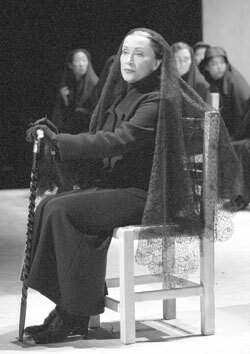 Would Rivera be interested in playing the crucial title role in a Mark Taper Forum production of Federico Garcia Lorca's dark masterpiece, "The House of Bernarda Alba"? "I must admit it was kind of wonderful when she asked me," said Rivera, looking fit and much younger than her 69 years in her dressing room at the Taper last week. "Most people, when they think of me, they think dancer-singer- musical comedy actress. But I've done 'The Rose Tattoo' and 'Born Yesterday' and several other plays. Yet I totally understand that attitude." Bernarda is a tough role for even the most experienced dramatic actress. Bitter, man- hating, ruling her unhappy household of five passionate daughters with a steely will and a frequently wielded cane, Bernarda keeps her brood sequestered inside their Andalusian home in an eight-year period of mourning after the death of her husband. It's a joyless and rancor-filled household. 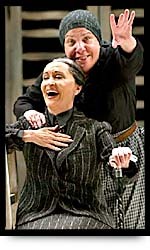 When Rivera first read the play, the role of Bernarda seemed impenetrable in its cruelty. But she and Peterson have found various ways of making the character seem nuanced, if not sympathetic. "I'm really hoping that what we're doing is going to solve (Bernarda's harshness), which was the thing that most struck me when I first read (the script). But people are not born this way. Things happen that change them. She's in this hopeless situation with five girls, not all from the same father, and she's stuck with a crazy mother." 'All about family' Although Rivera thinks Hispanic audiences may be more familiar than non-Hispanics with the culture and traditions that dictate the Alba family's lives, there is much about the story that everyone can relate to, the actress said. "It's all about family units, the pride, the depressions, the clashes that we all have in our families, and how we deal with them." Bernarda's heavy-handed decree of seclusion is more than just a reaction to the death of her husband. There are a number of other factors in play, Rivera said. "All the girls' lives are changing because they're all in love. 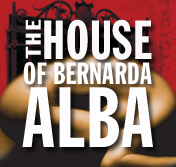 Bernarda knows something is going on within her family but she just can't get hold of it. There's a lot of intrigue going on." On a symbolic level, Lorca is commenting on Franco's heavy-handed rule and Spain's resulting alienation from the rest of Europe (Lorca's anti-Franco views resulted in his assassination shortly after "Bernarda Alba" was completed in 1936). But audiences don't need to know about the political context of the play to understand it, Rivera said. "It works perfectly well as a simple story, and it was based on Lorca's own life. There was a family that lived next door to him that was very similar to this family; they were always together and very secretive. He would eavesdrop on their conversations at the well (the families) shared. Everybody loves a little gossip, and we can all relate to characters who love gossip, like Bernarda." The severity and unfamiliarity of "Alba's" world could be off-putting to a modern American audience, but Rivera thinks that Peterson's unusual casting choices will make the play more accessible and more universal. "I'm concerned about the cultural foreignness of the material," Rivera said. "But Lisa has done this fabulous thing. When I came to the first rehearsal I noticed that there are Asian and Indian and Spanish names (among the actresses). I asked Lisa, 'What's the idea � is there another story going on here that I don't know about? Who are these women?' She said, 'No, I want these women to be the universal family. I want everybody to feel as if they recognize someone.' "Rivera acknowledged that multiracial casting is a risk in a play such as this one. "I hope � I pray � that we've achieved the right effect. We'll know soon enough." RETURN TO CHITA RIVERA MAIN PAGE!